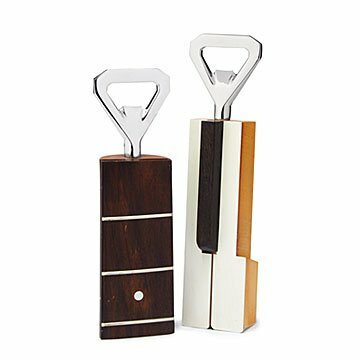 Made of vintage, reclaimed musical instruments, Ward Wallau's bottle openers make cool music lover gifts. You'll never hear the "can't find the bottle opener" blues when one of Ward Wallau's tuneworthy tools is jamming nearby. Made from parts of vintage, reclaimed instruments, like piano keys and guitar frets, they'll hit all the right notes for a piano player or music lover. Each one comes in a green flannel pouch with a certificate of authenticity. Handmade in Berkeley, California.